The category "World War II" Zippo is defined broadly here. Officially, the World War II Zippo was the 1942-45 Black Crackle Zippo. Due to materials shortage during the war, Zippo had to use the more porous metal steel instead of brass, and the lighter could not be finished with chrome or nickel. Instead, it was covered with a special black crackle paint. A benefit of this finish is that it would not reflect the light, thereby avoiding the attention of enemy snipers. The paint, while baked on, tended to become brittle and chip off, giving the Zippo a rugged look. The tradition from WWI of decorating lighters with coins and crude engravings, or "trench art" continued on the Zippo in World War II. Some of these decorated lighters were pre-war Zippos, including the 1940-41 brass Zippos with and without diagonal lines as well as earlier models. The vast majority of the lighters from 1936-1945 can be easily recognized by the rounded corners and absence of the post-1946 "canned" bottom. The bottoms are flat or protrude outwards in varying degrees even to the point that the Zippo will not stand upright on a flat surface. This is a typical 1942-45 World War II black crackle Zippo. It is made of steel (distinguishable with a magnet) and the paint along the edges has been worn down or chipped from regular use. A 1942-45 trench art Zippo with English coins. The reverse barely visible reads "L.R. Harper USNR '43" The rough surface is typical of the steel Zippos of that period. This 1938 Zippo is engraved with "Capt. 1st Lt. H W Edwards and serial number; Rome, Arno, N. Appenines, and Po Valley". "Oran, Algiers, Capri, Napoli, Pompei, Casserta, Roma, Firenze, Livorno, Pisa, Montecatini, Mongodoro-Loiano, Bologna, Verona, Milano, Genoa, Udine, Lago Gardo, Lago Maggiore" was engraved on the reverse. This lighter also has a one-of-a kind test model insert. Harry William (Bill) Edwards was the superintendent at the Congress Street Zippo Manufacturing Plant. Mr. Edwards was employed by the Zippo Manufacturing Company since 1938 until he left In 1942 to enter the Army. He was discharged with the rank of captain in 1946, at which time he returned to Zippo. 1942-45 black crackle Zippo with an attached Seal of the United States Army. This 1941 Zippo has a "military welfare" emblem and a Red Cross. During WWII, over 7.5 million Americans got involved with the Red Cross. 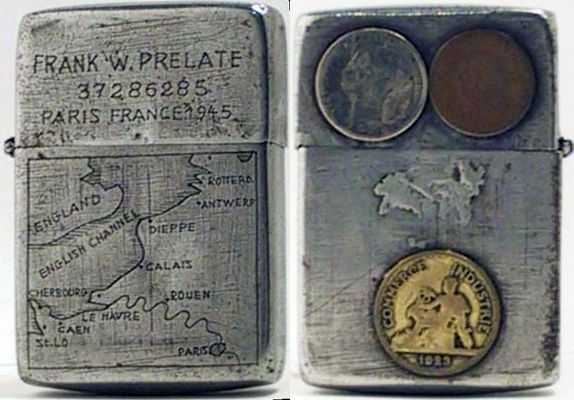 The reverse reads "Henry Hopkins Rome 1944"
This "trench art" Zippo has three french coins attached on one side and is engraved with the name of Frank W Prelate, his serial number, Paris France 1945 along with a map of the English Channel and France on the other. The map traces the route of the river Seine from Le Havre to Paris. This Zippo, engraved with the letters "GPL" has a sterling silver Navy emblem attached on one side and an oak leaf cluster & fraternal logo on the other. This 1942 Zippo is decorated with the crest of the 7th Infantry Regiment Militia & New York Army National Guard, the Seal of the United States and with an elk in relief. The reverse is decorated with three coins of Newfoundland. 1934-36 Zippo with repaired outside hinge. The front has an attached English 3 pence coin as does the reverse lid with the 3p coin dated 1920. The reverse case has a German Nazi pin attached. Both the lighter and the attached coins and badge show signs of heavy use and one can only speculate as to whether the lighter was once owned by an English Nazi sympathizer. or....? High-polish 1943 Zippo with the US Marine Corps' emblem attached. This WWII Zippo shows a World War I era tank, as seen from the side. Sterling silver lighter with a Zippo insert. It has the initials HS on the lid and the case has the emblem of the US Army's Persian Gulf Command, established in 1943 to assure the supply of U.S. war material to the Soviet Union. The reverse reads "Iraq 1944" and "Many Happy Returns of the Day - Crabby, Paul, John"
1942-45 black crackle Zippo with the initials BW. During World War II, Ernie Pyle, a famous war correspondent covered America's involvement in the war. His readership was worldwide, with his column appearing in 400 daily and 300 weekly newspapers. He journeyed to England in 1940 to report on the Battle of Britain. In 1942 he began covering America's involvement in the war, reporting on Allied operations in North Africa, Sicily, Italy and France. Ernie Pyle was also a Zippo fan. In 1944 he wrote: "The Zippo lighter is in great demand on the battlefield … truly believe that the Zippo lighter is the most coveted thing in the army." The American campaign against the Japanese on Okinawa still raged in early 1945 when Ernie Pyle was reassigned to the Pacific theatre. While making preparations for a major mission, a young officer asked Pyle if he knew what was up. Pyle knew but wasn't talking, so he asked the young man for his Zippo lighter. He scratched on the bottom of the lighter, gave it back to the officer and said, "Stick this in your pocket, and promise not to look at it until the orders are opened." Later, when it was announced that theoperation orders were opened, the young officer took the Zippo from his pocket. Scratched on the bottom was one word: "Tokyo", the objective of the mission.